All flooring surfaces require at some point in time cleaning of some sort. Cleaning becomes necessary due to traffic on it or due to its surrounding environment.Vitriturf surfaces like any flooring material require periodic cleaning. The frequency of this cleaning process depends on the intensity and type of traffic on it. If the traffic is heavy, the cleaning process might be necessary bi-weekly or on a monthly basis. In some cases, dissolved salts in water can deposit a whitish film on the surface. These dissolved salts are usually referred to as the hardness of the water. If this occurs, then cleaning is necessary to enhance the original colors of the EPDM granules. These “whitish deposits” can also bleed out from the environment the Vitriturf is in or from the proximity to concrete surfaces. The latency of the concrete can also bleed on to the Vitriturf creating this “whitish’ stain. Staining can also occur due to soft drink spills and/or chewing gum dropped on to the surface. The important point to remember is that Vitriturf is a flooring surface and therefore cleaning and maintenance need to be observed. In Pool applications, the use of Bromine should be avoided as this chemical creates severe staining. The cleanser we recommend to clean the Vitriturf and eliminate these “whitish” salt deposits is Soft Scrub with Bleach. Initially dilute the Soft Scrub at a proportion of one part by volume of the cleanser to two parts of water, mix well. 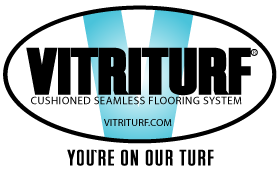 Clean the Vitriturf with the solution utilizing a scrub brush. The brush bristles should be reasonably stiff so the floor contaminant can be removed and also be of enough thickness to penetrate the space within the EPDM granules. Follow this by rinsing the Vitriturf with water. If a “white” film persists, repeat the process above but dilute the cleanser in a proportion of one part cleanser to one part of water. If the buildup is excessive use the cleanser without diluting with water. You may use a power wash machine as well to clean the surface. The best method is to utilize hot water with a mixture of the Soft Scrub solution. The best tactic to practice with regards to cleaning the Vitriturf is to act quickly once the contamination appears. If the contamination is allowed to build up, then the cleansing process becomes increasingly difficult. The suggested cleaner is Soft Scrub with Bleach. Substitutions can be made with equivalent products provided they are tested prior to use. For more information, please contact Hanover Specialties Inc at 631.231.1300. The Vitriturf warranty does not cover damages due to absence of cleaning methods and/or improper methods not sanctioned by Hanover Specialties Inc.